Yesterday I was staring with no particular purpose at the bookcase in front of me. The books have been moved around repeatedly and so are mostly in no order, many of them lying on tops of shelved books by the threes and fours. 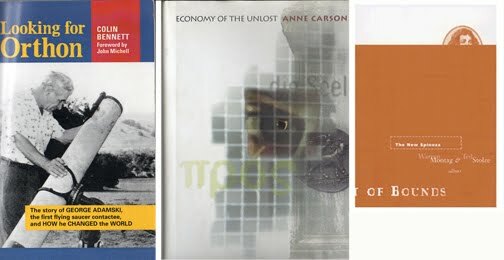 I was reminded of some quip about the connections and patterns that a library can make, even under fairly well-ordered circumstances so herewith a series of volumes that were truly found together, usually stacked on top of each other, set adrift into meaning by the clinamen, by making a nice trinity. I have, more or less, randomly selected a a quote from each book, in the cse of two of these, by a pencil or other bookmark stuck and left in place. The New Spinoza, Warren Montag and Ted Stolze.